Image credit: Go Oak Cliff. For years now, Brew Riot has been one of a handful of local events that celebrate the homebrewer...a.k.a. the origin of the craft beer movement. This year, though, Brew Riot wasn't meant to be. The festival's growth over its first eight years has forced organizers to seek out a new place to hold the event, which they say will return bigger and better in 2018. In its place for 2017, though, fans of Brew Riot were presented with an alternative in the form of the first ever Dallas BrewHaHa. Produced by Go Oak Cliff, the same folks behind Brew Riot, the placeholder event (as it's been called) went down this past weekend, bringing with it a new vibe and a new venue with which to celebrate craft beer culture. The vibe, in this case, had more of a standard weekend festival-type feel, with vendors, artisans and food tents replacing the surroundings of the bustling Bishop Arts neighborhood. It was different, but not in a bad way, being simply a more everyday way for the craft beer community to come together. With respect to the venue, BreHaHa was held at the new facility of Four Corners Brewing Co. in The Cedars (located at 1311 S. Ervay St.). 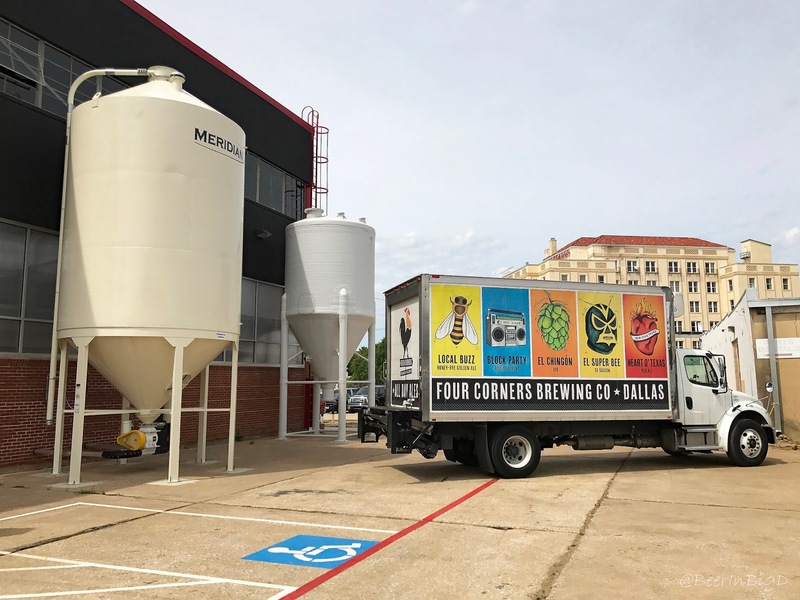 Set up on a two-acre tract of land in that South Dallas neighborhood, the brewery's new digs sit opposite the historic Ambassador Hotel. A warehouse built on the spot in 1925 has been renovated to house the company's 16,000 square foot production space, which will be offset by a taproom-to-be under construction inside an existing building off its front elevation. That structure, incidentally, once served as stables for the hotel across the way (see image captions for more on Four Corners' new location). The Ambassador Hotel hovers over the front of Four Corners' location in The Cedars. A taproom is under construction in the building to the right (off-image). It will an feature an event space, on-site food service, and a small-batch brewing system as its centerpiece (© Brian Brown/Beer in Big D). Four Corners is replacing its original 30-bbl system with a new setup anchored by a four-vessel 50-bbl brewhouse (© Brian Brown/Beer in Big D). It was the beer, though, that ultimately brought everyone together for the BrewHaHa, as just short of 30 homebrew teams signed up to compete and sample their latest creations. Among them were at least two entities that hope to be open and serving the public by this time next year. Oak Cliff Brewing Co., working to set up shop at Tyler Station in Oak Cliff, served up a portfolio led by a twosome of tasty lagers - Oak Cliff Export and Bishop Black Lager, while Steam Theory Brewing Co., under construction in Trinity Groves, poured a Dank IPA and the wonderful Wee Piggy (a bourbon barrel-aged wee heavy). Also looking to join the professional ranks at some point is Celestial Beerworks, which showed an affinity for hops with brews like Kepler (a New England-style IPA) and Gravitational Collapse (American pale ale). Yet another, Bleshoux Brewing, produced my favorite beer of the day, a spice-infusion by the name of Chai Times Blonde Stout. Surveying others on hand, longtime Brew Riot participants like Mox Nix Brewery (currently collaborating with Cobra Brewing Co. on beers like Raspberry Rye and Citra Blond) and Knowles Brothers Craft Brewing continued to impress, the latter even rolling out a ridiculous 18.5% ABV imperial stout called By-Tor. They led a wave of relative newcomers (i.e. groups that have only been around a year or two) that combined to produce a range of interesting beers that didn't seem to take any current trends too seriously. Teams just made good beer, for the most part and, in fact, I'd say the quality of the beers offered was as good or better than it has ever been...whether we be talking about Brew Riot or other area homebrew extravaganzas. As for what else I tried, a handful of notable brews are listed below. Those who created them may be unfamiliar, but who knows...someday one might be a household name. Cheers! Driveway Brewing - Barrel-Aged Krew Brew (vanilla milk stout). * Visit Go Oak Cliff's Facebook page to see additional images from the event.